I'm not even going to pretend that I knew this. Mind = Blown. It's a conspiration to subluminaly teach Spanish to all your kids. MWAHAHAHAHAAAAA... er, I mean, MUAJAJAJAJAJAAAAA!!!! A= First letter of the alphabet M= 13th/middle letter of the alphabet Z= Last letter of the alphabet Coincidence? I think not. Yugioh? I challenge you to a d-d-d-duelllllll! well people do zap moles with ice dont they? freeze away! 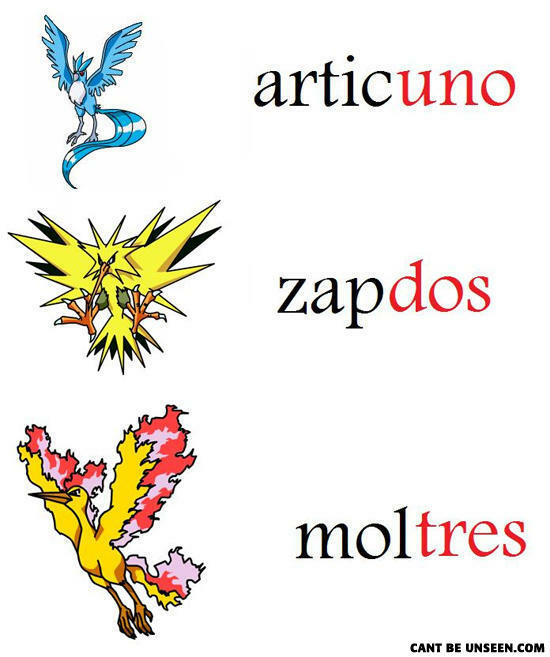 but pokemon aren't spanish, thats the funny thing. my teacher says pokemon make me stupid . to the person who said "Terrecuatro will be next" how can a ground type also be a flying type? hm??? Say what! Never saw that! People really didn't know this? if you dont get it, LOOK AT THE RED NOT THE BLACK! WETBACKS! Stealin our childhood too! Arctic Zap Mol? I don't get it. SHUT UP! I DISCOVERED THIS MYSELF WHEN I WAS 5! GO AWAY STUPID POKEMAN FURRIES! I didn't know that. YOUR ARGUMENT IS INVALID. typically for the french variants of these Pokémon, the suffixes and Egyptian Gods: Odin, Thor and Ra. my brothers and I realized this when we were little kids. So cheers for posting this and wasting our time, captain sarcasm. Squirtle=Squirt+Turtle Ha bet you didn't know that! Oh... Never mind. Q: What's worse than eating cauliflowers? A: Eating cauliflowers and getting raped by Jerry Sandusky at the age of 7.